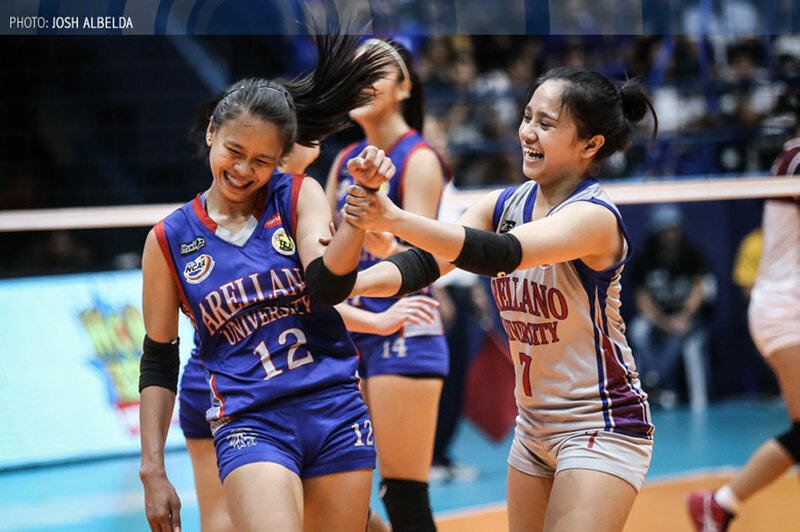 MANILA, Philippines -- (2nd UPDATE) Arellano University recovered from a meltdown in the opening frame to overcome University of Perpetual Help in four sets, claiming an emotional victory in Game 3 of the NCAA Season 94 women's volleyball finals. In front of a massive crowd on Tuesday at the FilOil Flying V Centre, the Lady Chiefs hacked out a 22-25, 25-15, 25-18, 25-18 triumph to secure their third consecutive women's volleyball crown. The Lady Chiefs completed a come-from-behind win in the best-of-3 championship series, having gone down 0-1 after the Lady Altas snatched the opener, 21-25, 25-17, 25-21, 25-20, 10 days ago. But the defending champions struck back in last Friday's Game 2, coming away with a hard-fought 23-25, 25-9, 25-18, 22-25, 15-12 triumph. "Kung titignan natin talaga 'yung Perpetual, mataas 'yung respeto namin. Talagang sinukat talaga nila kami," said Arellano coach Obet Javier. "Pinilit nilang ilabas 'yung dapat naming ilabas. Nagpapasalamat kami." "'Yung pagkakatalo namin ng Game 1, malaking bagay 'yun. Dahil doon, natuto kaming bumangon," he added. This is Arellano's fourth title in the last five seasons. Finals MVP Regine Arocha finished with 16 points, including 5 service aces. Princess Bello had 12 points, while Necole Ebuen and Carla Donato each had 11 markers. Donato scored five of her points off kill blocks. The Lady Altas displayed their tremendous fighting spirit in the opening frame, as they battled back from a 14-7 deficit to seize the win in Set 1. Graduating open spiker Cindy Imbo came through with the clutch hits that sparked Perpetual Help's comeback, including the kill that knotted the count at 17. Arellano pulled away once more at 20-17, only for the Lady Altas to respond with a 6-0 run -- highlighted by a trio of powerful kills from Imbo -- to seize control of the set. Perpetual stifled the Lady Chiefs all throughout the frame, limiting the defending champs to just five attack points. But Arellano found its rhythm late in the second set, pulling away from a tight 16-13 count behind Ebuen, the Season 94 MVP. The Lady Chiefs overwhelmed the Lady Altas after the second technical timeout, with Ebuen coming through with crucial attacks. 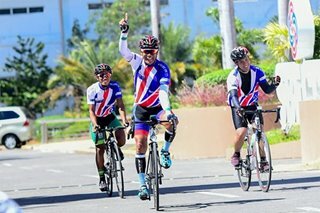 "Sinabi ko lang naman sa kanila, na kung gusto nating manalo, huwag nating pahirapan, kunin natin," said Javier of his team. "'Yung mga bata, willing na willing manalo, kaya kahit sabihin natin na down kami ng first set, pinilit namin." Momentum was clearly on Arellano's side by the third frame, and they raced to a massive 20-8 advantage. The Lady Altas roared back to life behind some unforced errors by Arellano, and came to within five points twice, at 17-22 and again at 18-23. Their rally came too little, too late, however. Bello beat the Perpetual blockers for set point, and an attack error by Imbo sealed their fate. The Lady Altas managed to stay close in the fourth frame, even leading 13-11 midway through as Imbo found her second wind. It turned out to be their last hurrah, however, as the Lady Chiefs responded with 11 unanswered points to break the set open. Arocha was superb once more, finishing combination plays, while Bello made her presence felt. Perpetual threatened late, coming to within six points at 23-17, but Ebuen fired a massive crosscourt kill that brought them to championship point. The Lady Chiefs were made to wait after they were called for a violation in the next rally, but they did not even have to work for the final point: Perpetual Help's Jenny Gaviola committed a service error that handed the match -- and the title -- to Arellano. In her final collegiate game, Perpetual's Imbo had 12 points. Hannah Suico and Gaviola each scored 10 markers. However, the Lady Altas could not overcome an error-strewn performance, as they gave away 36 points off their own miscues. Also playing in their last collegiate games for Perpetual Help were skipper Bianca Tripoli, Jowie Verzosa, Necelle Gual, and Hershey Llorente. The result of the women's match denied Perpetual Help a rare triple crown in NCAA volleyball, as its men's and juniors teams had clinched the title in their respective divisions last Friday.